U2's Bono, Larry Mullen Jr, The Edge and Adam Clayton rock Chicago during their "360 Tour." Photo by Neil Sobleski. 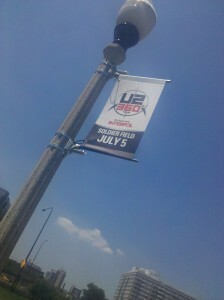 Your dedicated reviewer went to Chicago on July 5 for her first of three U2 shows this month. Other “360 Tour” shows she’ll be reviewing include Busch Stadium in St. Louis (7/17) and Heinz Field in Pittsburgh (7/26), the final stop for the tour. Tickets still are available for both shows. Learn more at u2.com. I’ve finally forgiven Bono one year after he threw his back out and canceled my 2010 Chicago show. And all it took was U2 playing a rare song live and completely blowing my mind. This ticket from 2010 finally became useful this year. U2 fans will know that Bono wrote “One Tree Hill” after the death of his assistant, Greg Carroll, in 1986. After U2’s “Lovetown Tour,” the song only has been performed in recent years in Chile, Japan and Carroll’s native New Zealand. So during the final encore, after Bono told Chicago that he was thinking about his former assistant on the 25th anniversary of Carroll’s death, he was persuaded by the audience to “check with the professor” (guitarist The Edge) to see if the band still had the balls to play it. Play it they did, and audience members knew they were getting something pretty damn special (I can’t tell you how many times I screamed “OMFG!”). Scroll to the end of this review for video of this rare song. Ok, so beyond that early Christmas gift of an encore, was the show still good? Calling the monstrous “claw” structure around the stage their “spaceship,” U2 kicked off the show with David Bowie’s “Space Oddity,” first pumping the original song throughout the stadium and then fading into the band taking over The Thin White Duke’s famous song. They morphed that into “Breathe” from 2009’s No Line on the Horizon before Bono shared that the band has been having fun recently playing songs from Achtung, Baby, recorded in Berlin 20 years ago. U2 used that as an opportunity to showcase three Achtung songs: “The Fly,” Mysterious Ways” and “Until the End of the World,” all of which were changed from the original 1991 recordings and sexed up with funkier guitar and rhythms. “Elevation” and “Pride (In the Name of Love)” were the low points in the next segment, failing to work the mega-magic they did on previous tours. And even though “Miss Sarajevo” was gorgeous and meaningful, not even Bono’s boombastic Italian solo could rouse the crowd during this slow number. Things picked back up with the energetic “City of Blinding Lights” from 2004’s How to Dismantle an Atomic Bomb, and Bono offered more Chicago love with a snippet of Frank Sinatra’s “My Kind of Town” thrown in. The band brought out their remixed “I’ll Go Crazy if I Don’t Go Crazy Tonight” that debuted at the start of the tour, which led into the still-powerful “Sunday Bloody Sunday.” The band wrapped up the main set with an emotional “Walk On,” still dedicated to Burmese activist Aung San Suu Kyi. 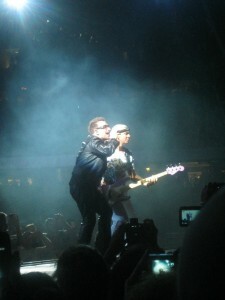 Bono and Adam Clayton get busy. Photo by Neil Sobleski. U2 had two encores up its sleeve. The first featured songs that are part of most shows: “One” and “Where the Streets Have No Name.” In the second encore, songs from three decades made their appearances. First, “Hold Me, Thrill Me, Kiss Me, Kill Me” from 1995’s Batman Forever soundtrack was a delight for the audience. The band then headed back to the 80s for a touching “With or Without You,” which featured Bono swinging on a steering-wheel-shaped microphone that dangled from the rafters as Adam Clayton plucked out his heartbeat of a bassline. 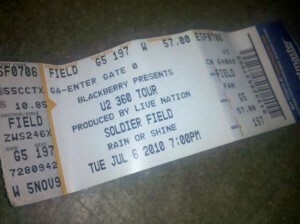 Finally, U2 performed its standard “360 Tour” closer of “Moment of Surrender” from 2009’s No Line. Bono worked a tiny, tiny snippet of “One Tree Hill” into the song, and that’s when all hell broke loose and the band was compelled to perform the song in its entirety. With a tightly choreographed tour like “360” and setlists posting to Twitter as soon as the first guitar licks happen, it’s not often that fans are surprised at U2 shows. But Bono sings “The future needs a big kiss” in “Get on Your Boots,” and he and the boys slapped a doozy of a kiss on us with that emotional gem of a surprise. Note: Full setlist at setlist.fm. On Friday, look for my tips for surviving the general admission line at Sunday’s U2 show at Busch Stadium in St. Louis.